The focus of this release was the usability of the Voxel Editor UI. So far we've reworked the Edit Tool to make it hopefully more intuitive to use. We've also started adding tooltips, warnings for actions that cannot be undone, and a default Materials palette to help getting started. For those who have never used Avoyd before, we added a tutorial to introduce the basics of creating shapes. It can be found under the new Help menu. 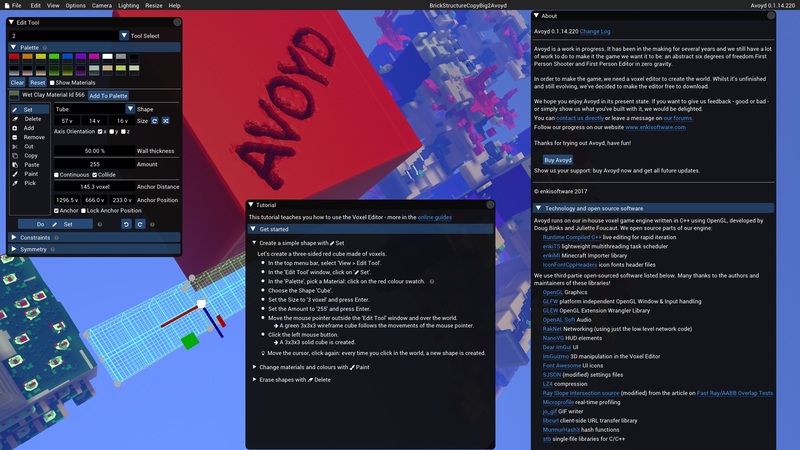 You'll also find links to our forum, the change log, our website where you can buy Avoyd, the tutorial and an About page listing all the open source libraries we use in Avoyd's game engine.